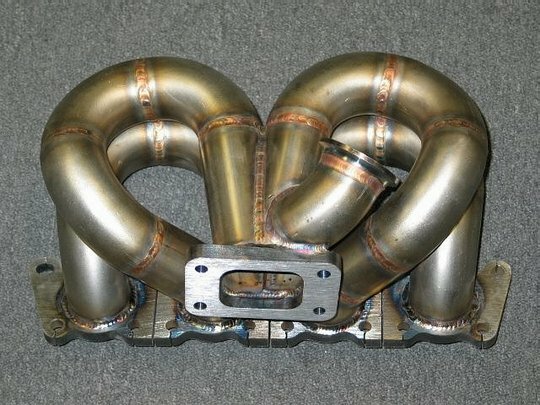 1.8T Transverse ProStreet Turbo Manifold. Full-Race engineered turbo manifold for the VW 1.8T motor. This T3 turbocharger manifold is a must for those seeking to extract maximum power from their setup. - Volkswagen 1.8T transverse engine configurations. - Manifold designed for standard garrett 4 bolt T3 sized turbines with either T04S, T04E, or T04B compressor housings. - T04E compressor housing can be clocked with the outlet facing upwards or downwards. - T04S compressor housings must be clocked with outlet facing downwards. - Designed for use with TiAL 44mm waste gate only. - Flanges machined flat after fabrication for a leak free sealing surface.